It is important to note that Bob Otto is constantly developing and acquiring new skills and techniques through specialized training by instructors who are considered to be experts in their respective fields. Such training may or may not be listed below. 1994 -Present New Smyrna Beach Police Department. 1994-1998 NSB SRT Special Response Team. 1973-Present Okinawan Uechi Ryu Karate Do. 1979-Shodan-(First Degree Black Belt) Uechi Ryu Karate. 1983-Nidan-(Second Degree Black Belt) Uechi Ryu Karate. 1987-Sandan-(Third Degree Black Belt) Uechi Ryu Karate. 1990-Yondan-(Forth Degree Black Belt) Uechi Ryu Karate. 1994-Godan-(Fifth Degree Black Belt) Uechi Ryu Karate. 2001-Rokudan/Renshi-(Sixth Degree Black Belt) Uechi Ryu Karate. 2008-Nanadan/Kyoshi-(Seventh Degree Black Belt) Uechi Ryu Karate. 2015-Kyoshi/Hachidan-(Eighth Degree Black Belt) Uechi Ryu Karate. 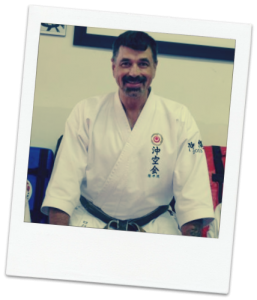 All Above “Dan” Ranks And Teaching Certifications Received From Okinawa, Japan. Brazilian Jiu Jitsu 2006-Present Blue Belt Gracie Barra. Winning Numerous Heavy Weight Black Belt Fighting Tournaments 1st, 2nd & 3rd Place.